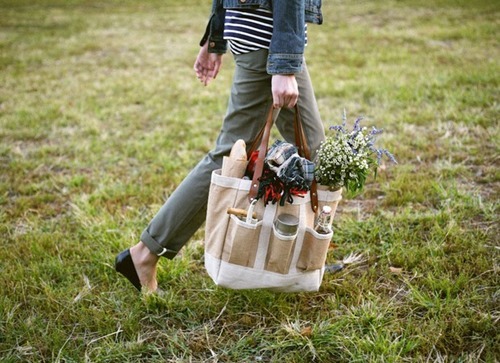 I noticed the popularity of these tote bags aka garden bags by Apolis + Kinfolk. 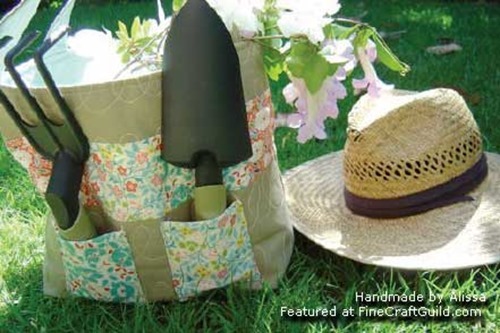 So, I though you might also like the garden/tote bag pattern we have featured here some time ago. This tote bag by Alissa is a free bag sewing pattern, which is ideal to make your own garden bag similar to the one by Apolis (simply omit Alissa’s quilting details). Just the look of this picture makes you want to go on a picnic with her, right?! White burlap , or consider as an alternative: white canvas fabric . Natural burlap, by the yard . Btw. besides natural & white, this burlap comes in fun pink, chocolate brown, Spring green, and other colors. Note that burlap (i.e. 100% jute) is inexpensive, sturdy fabric that is ideal for making heavy duty tote bags. 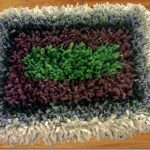 You might like to add a lining of a water repellant fabric, or a nice, softer fabric. What’s best depends on how you intend to use your handmade bag. See that?! The Apolis bag pockets are folded, whereas Alissa’s are not. Folded bag pockets make bigger pockets. And that’s good. Look! These folds allow the pockets to contain 3D objects such as thermos flasks, coke bottles, your entire set of picnic cutlery, etc. 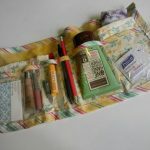 How to Make Folded Bag Pockets is easy! What you’ll need to do is cut approximately 1.4x the fabric needed for a flat pocket. Make 2 equal folds, one on either side of the pocket, folding outwards (see the picture of the Apolis bag). Pin and sew along the edge of the pocket. These leather handles are only $25.98 and qualify for free shipping. OPTION 2: for DIY leather handles, consider leather scrap strips. Amazing deal: $9.95 for tons of DIY handles. Strap Leather 7-8 Oz, Assorted Earth Tones, 5 Lb Bag . Strips average 2-3 inches and 5 feet long. Click link as there are a couple of different leather assortments with pretty colors. Great for leather craft! Click here for other leather bag handles for sale. Particularly the Clover leather handle straps are nice. Click the image for black leather bag handles, or choose the dark brown -version of these 24-inch leather tote bag handles. 1. You might like to reinforce the bottom section of the Alissa bag, just like the Apolis is a double layer for the bottom. How to? Easy. Measure the width and the lengths of the sections you would like to reinforce and cut pieces to match. Allow for 1/2 inch seams all around. Sew fabric layers together before putting bag together for easiest handling. 2. Last but not least: if you don’t have one already… consider buying or making yourself a bag organizer. Get yourself a bag today. 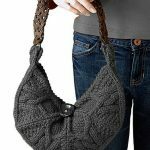 If not the one above, then consider maybe 100 or more bag patterns and designs for all kinds of bags, from credit card pouches, to coin purses, to make up bags, lunch bags, back pags, clutches, hand bags, shoulder bags, market bags, diaper bags, tote bags and … well, any other kind of bag under the sun. Even some Anthropologie-inspired bags and an online sewing workshop on how to ‘anthropologize’ your bag designs. Without further ado, visit our …. Btw. I just spotted another really cute bag by Apolis: this Apolis French Trotters Market Bag Men’s One Size. Golden Jute . To celebrate their new partnership with Paris’ FrenchTrotters, and the spirit of local French village markets, Apolis released a limited edition collaboration of our Market Bag, co-branded and painted with the drapeau français, French flag. What I like about it, besides the bag’s gorgeous design, is that this bag supports Bangladesh. Note: this article contains links to online retailers. 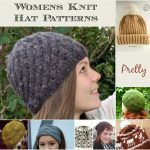 I will earn a small commission if you use these links to purchase your items, and I thank you in advance for doing so and in this way support the maintenance of this blog with 1000+ free patterns & designs, quality references and novel ideas.